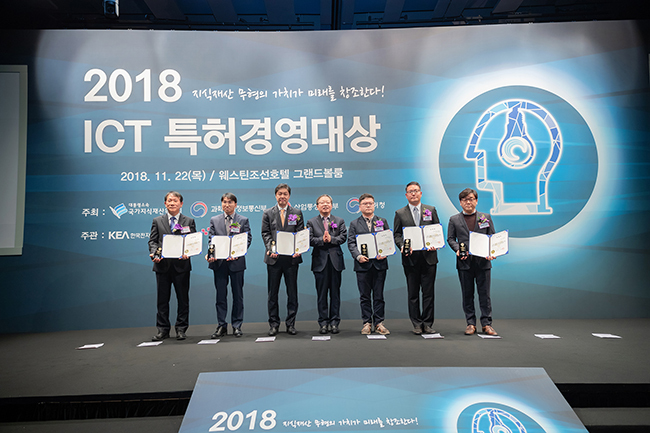 Won the Silver Prize from the "2018 ICT Patent Management Awards"
This awards ceremony is the sixth event this year and the ceremony hands out awards to individuals and corporations who have gained excellent achievements by actively utilizing intellectual property to discover patent management strategies and spread the patent value. The event was hosted by the Presidential Council on Intellectual Property, Ministry of Science and ICT, Ministry of Trade and Industry, and the Korean Intellectual Property Office. Since its establishment in 2002, Solbox has made significant accomplishment with eighteen domestic patents, three international patents and sixteen domestic software copyright registrations. This success could be made through ongoing development of CDN service technologies such as content caching (web acceleration), media streaming, server load balancing, video ad insertion, cloud storage, content security, and video transcoding.